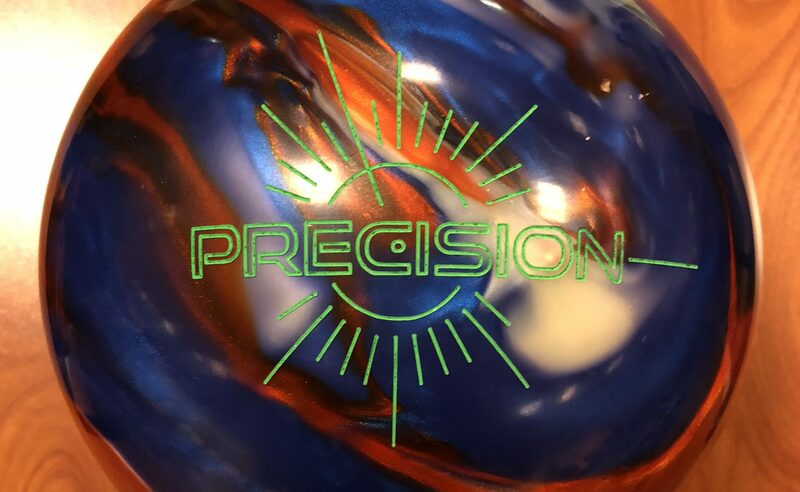 The Track Precision is the newest ball in Track’s top shelf line. It’s a pearl asym and generally we find that combination to be pretty versatile. The Precision uses the new Precision SD (Single Density) inside the also new Prime Pearl coverstock. Alright, so the Precision has the patriotic theme going. It actually looks really nice in person. With that said, Track brings a new pearl coverstock formulation wrapped in a new core design. The core is what I like to call a “blocky” design and if you have a keen eye, you can relate roll to core shape. Basically you have a polished moderately aggressive pearl allowing the ball to get down lane without a lot of fight. What’s really cool is that I had a white spot right on my PAP so you can easily see the core migration. Here you can pick out the low RG as the core is already visibly migrating by the arrows and is almost fully transitioned by 40 feet so you have this nice move off the pattern and then straight drive through the pins. The ball was pretty easy to find pocket and see good carry. I kept migrating until I saw the flat hit and then worked my way back to the sweet spot. That said, right around 3rd arrow was best for me with this ball to find that perfect shape. Comparing to the more aggressive Alias with a 2000 abralon finished hybrid version of the Prime coverstock and you can see it have similar board coverage but rounder through the transition. It’s burning up a bit as it is too aggressive for this pattern. For Sean, should I just say pearl asym and move onto the next tester? I won’t that’s pretty much it. Clean look, doesn’t have to fight it to get it downlane. The balls got plenty of giddy-up to “wheel and deal”. He gets in past that 4th arrow high rev track and just throws it away from the pocket with plenty of confidence it will make the turn. This is the kind of reaction where he really wants to be careful with misses in as the ball can be quite aggressive. So get it away and he knew it was coming back with that heavy asym roll that seems to straighten out just right. He also compared to the Alias and it is clear the Alias is stronger, unnecessary for him, and pushes him unnecessarily out of his comfort zone due to the earlier roll. He knows the cover will read sooner so he has to “push” the ball downlane more. For Bryan, the Track Precision really had that long and strong look. He liked this ball right away. He could see the move and it made it predictably. He can also feed it to the friction and watch and aggressive move back rather than that DOA look. As did the rest of us, Bryan took to this ball straight away. He didn’t have to worry about nuances. The ball just worked. When compared to the Alias, this is the perfect compliment. Bryan always liked the Alias but found the line to burn up quickly with it because of it’s aggressive nature. Here you can see that smooth heavy rolling characteristic which makes it one step up from the Precision as it should be. Finally Dave was up next. Once he got lined up, the ball was easy. As he took to the lanes to see what this ball does, even while he set up a bit too deep to start, as he squared up in small increments the ball was very predictable. It didn’t all of a sudden go through the face which is a really good sign. It shows the ball can blend the release or pattern. He gets even more length than I do but sees a strongish transition. When comparing to the Alias, you can feel the Alias lumbering more. Just feels more chuggy and smooth but still made the transition which is always a characteristic we’ve seen with that ball. We tested on the 47 ft PBA Scorpion. This pattern is long and plays long. This ball in OOB surface would’nt come into play for most of us in a typical set on this pattern. For me, I would probably still be using surface as the pattern is fairly fresh however, the ball surprised me. It wasn’t super jumpy. Still seemed to get there with half decent execution. I even had shim with miss in. This tells me it’s the type of ball I could use, but would just put some surface on it. For Sean, shiny syms come into play pretty quickly as it breaks down so this a good representation in his hands. The Precision looked really good for him. Really easy to get to the pocket and strike. For Bryan, he certainly not typically entertain anything shiny on this long pattern so he had to make sure he was squared up enough. He basically was able to slot in the same area as any of his aggressive stuff. It was just a touch more sensitive to misses but surprisingly not as much as you would expect. The Track Precision faired very well in our test. Every tester had a very easy time getting this ball to work. It offers a good blend of length with heavy rolling core. Doesn’t feel as lumbering as some balls with huge asym cores but also not uncontrollably flippy and that’s a good thing. It makes it usable on house and sport shots. It also makes it usable for many bowlers. 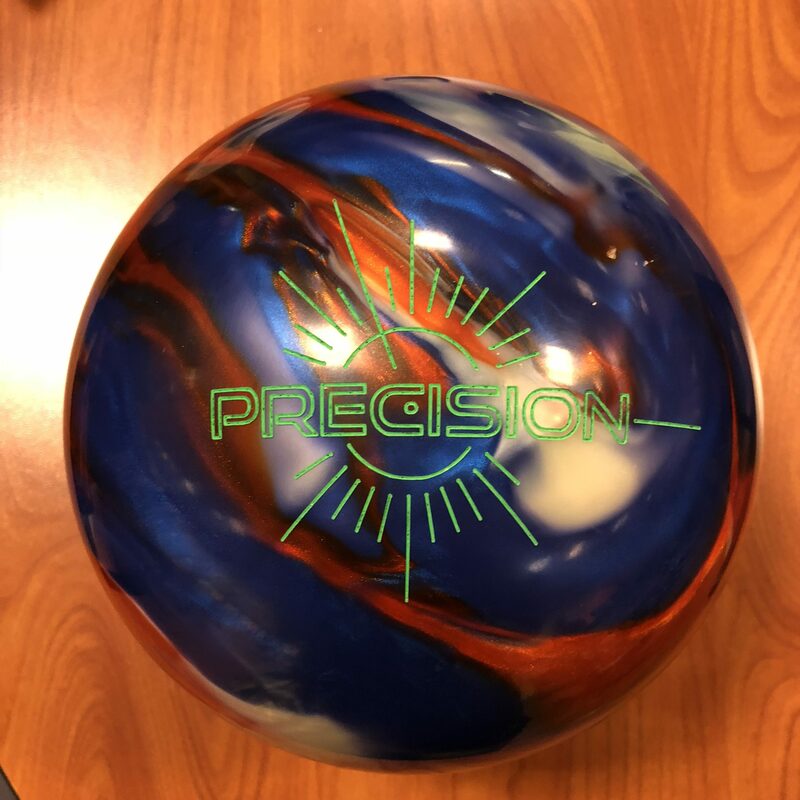 Track fan or not, this ball is a worthy contender to fill the pearl asym in the bag!